Synopsis: Recently published estimates in Science are orders-of-magnitude too large. In response to this review article in Science, we describe why the noted generation rate estimates for wind power and solar PV are too large. For wind, the atmospheric dissipation rate of ~2 W/m² limits wind power generation to much less than the 30 W/m² stated, which is supported by several model-based results. For solar PV, their stated upper bound of 120 W/m² is well beyond our observations of 10-20 W/m² from 3 commercial-scale operational solar farms. While the clarity of their estimate is appreciated (sunny conditions of 200 W/m² with 40% efficient panels), it presumes that 100% interception of solar irradiation over a complex urban landscape can be achieved, which is theoretically possible, but disregards all practical and economic considerations of covering all ever-illuminated surfaces with PV panels. Figure 1 of Kammen & Sunter places the energy demand of present-day cities (~20 W m-2) between “typical [and]… potential [renewable energy] performance, based on optimal conditions and technologies currently available in the laboratory.” Yet the Wind range of 2.5-30 W m-2 is wrong, the Solar PV range of 10-120 W m-2 is misleading, and cold weather downtowns often require up to 500 W m-2. After a wind farm extends downwind for more than ~10 km, including the consideration that wind turbines and the atmosphere will be directly interacting, limits the electricity generation rate to about 0.3-0.5 W m-2 globally, and about 1-1.5 W m-2 in windy locations [1-6] atypical of cities. First recognized by , this limit relates to the atmosphere’s ability to continually generate motion (~2 W m-2 globally), rather than the specifics of the wind technology. Caption: Showing the result of estimating electricity generation rates from wind power which fail to consider (x-axis) or include (y-axis) how wind farms can slowdown wind speeds and alter atmospheric transport. 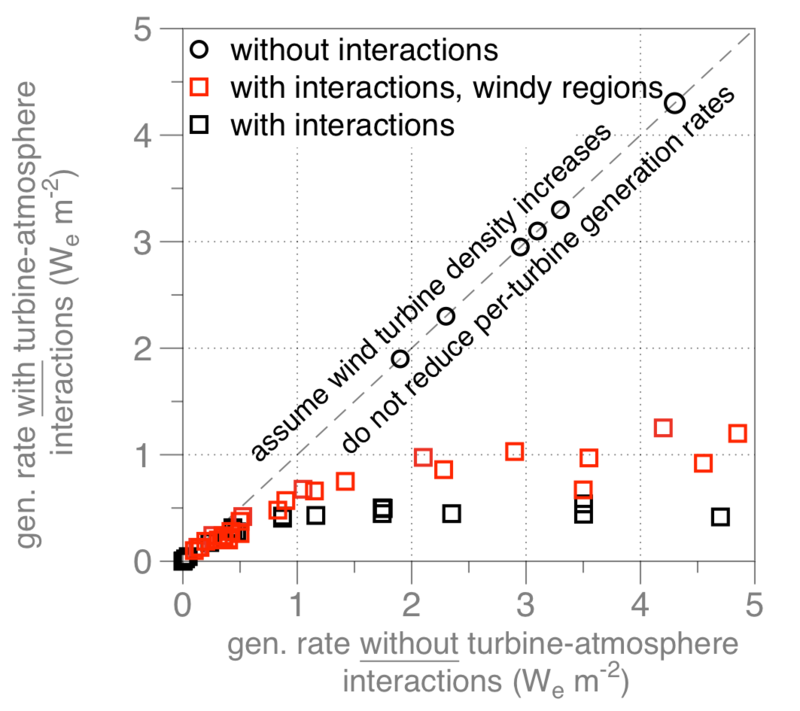 Note how for generation rates less than about 0.25 We m-2, estimating generation rates with or without turbine-atmosphere interactions yield similar generation rates – these instances represent wind farms with larger between-turbine spacing, and therefore reduced interactions. The circles represent studies which did not include interactions, while squares represent studies which estimated generation rates with and without interactions. The red squares highlight those ‘with turbine-atmosphere interaction‘ studies which estimated generation rates for wind farms in only windy locations [1,4,6]. All data points are the same as shown in Fig. 5 of . 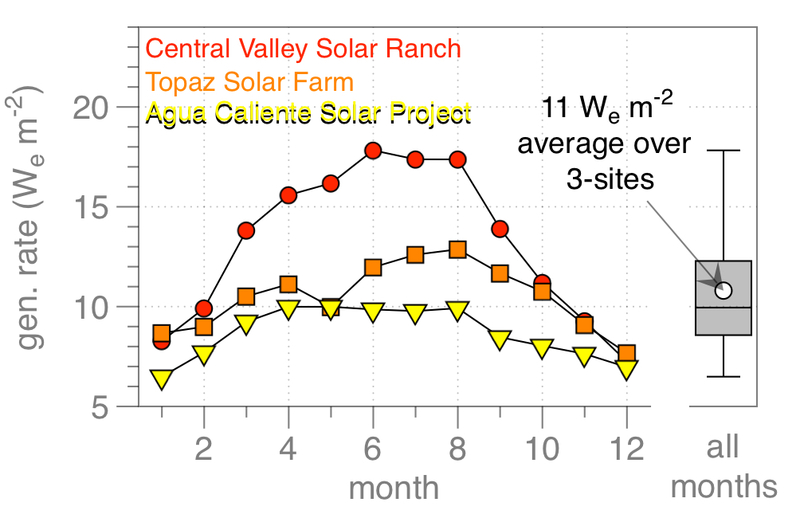 Solar PV, based on observed 2015 generation rates and footprints from 3 newly constructed solar farms, generates about 11 W m-2 (8.7 W m-2 over 2400 acres by Agua Caliente Solar Project; 10.5 W m-2 over 3500 acres at Topaz Solar Farm; 13.2 W m-2 over 1475 acres at Central Valley Solar Ranch, [8-13] consistent with [14,15]). 10 W m-2 is, therefore, not “conservative” (p.922), but rather representative of state-of the art industrial facilities presently operating in regions of flat terrain with excellent insolation, and receiving ongoing maintenance. A doubling of PV generation to ~20 W m-2 could be achieved if the entire city surface was PV – this does not violate physical laws, but is oblivious to economic trade-offs of cost vs efficiency. These physical and economic considerations explain why current PV generation rates in cities are typically lower than industrial sites. Caption: Showing the observed monthly mean generation rate during 2015 for 3 industrial-scale solar PV farms in California and Arizona (USA) [8-13]. Integrating renewables into cities is possible, and it might reconnect us to our environment with everyday reminders of our energy demands. A sound path begins by establishing achievable, near-term realities for renewables, and then incrementally leveraging these small successes. Harvey & Associates (2010) Biological assessment for the California Valley Solar Ranch Project San Luis Obispo County, California. Smil V (2015) Power density: a key understanding energy sources and uses. MIT Press. MacKay DJ (2009) Sustainable energy — without the hot air. UIT Cambridge.